What's the difference between "Author/Date" and "Notes & Bibliography" formats? Author/Date uses parenthetical text citations while the "Notes and Bibliography" format uses numbered notes. The full listing of sources in the Author/Date format is a Reference List. The "Notes and Bibliography" format uses a bibliography. The order of information given is also slightly different in the Author/Date format. What are "Chicago" and "Turabian"? Chicago style refers to a specific formatting style created by the University of Chicago Press in 1906. 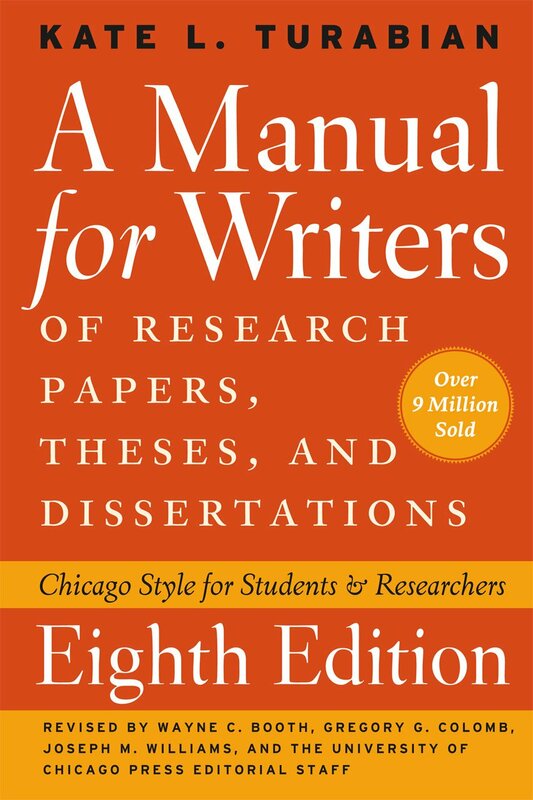 Turabian style refers to Kate L. Turabian's Manual for Writers of Research Papers, Theses, and Dissertations. Turabian style is based on Chicago style but has been slightly modified to apply to student writing. Chicago and Turabian are most commonly used by students and scholars in history, business, and fine arts when writing papers and citing sources. How do Chicago and Turabian work? Chicago and Turabian both use two systems of citation, Notes and Bibliography or Author-Date. Notes and Bibliography is most common in history, literature and the arts. It uses footnotes or endnotes, which allow for information about unusual types of sources as well as commentary on the works cited, in conjunction with a full bibliography. Author-Date is most common in the sciences and social sciences and uses parenthetical author-date references with a corresponding reference list. Examples of Chicago and Turabian citations can be found by source in the box on below or from the drop down Chicago/Turabian menu. Many professional scholars use the Latin term ibid. to mean "the source I cited," but Chicago prefers the use of a shortened citation. Teachers who want you to use ibid. will explain how, or you can read about it in the notes and bibliography chapter of The Chicago Manual of Style. "Chicago style" is a citation format and publishing style guide used across multiple different subject areas and fields. 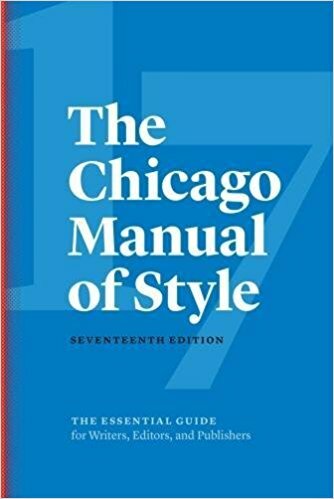 As a student at the University of Iowa, you have FREE access to the 17th edition of the Chicago Manual of Style Online through the library! This section covers all aspects of scholarly publishing across multiple formats from books, to journals, to electronic formats. Although you may not need to know every aspect of formatting page numbers in a book, or how to layout a copyright statement, there is TONS of great information in this section to help you create habits you will likely use later in your scholarly career. By formatting your work the right way from the start, you'll save yourself time (and a headache) during the editing process. This section of COMS explains all elements of writing, grammar, and document style, in Chicago style. This is where to turn to finally unravel the mystery of semicolon and comma usage, figure out how to insert that mathematical equation properly, and determine once and for all where the punctuation marks should go in your quotations. Part three is the bread and butter of the CMOS and is most likely the section you'll turn to most during your writing process. Here you'll find explanations of Chicago's "Notes and Bibliography" and "Author-Date" citation formats as well as examples for creating citations for books, movies, articles, interviews, tweets, papers, and pretty much any other source material you can think of. What You'll Find in "The Turabian"
A classic handbook for collegiate writers, the "Turabian" is now it its eighth edition and is available in print and as an e-book. For quick questions and examples, check out the "Turabian" Online! This section covers the basics of how to structure your research project, how to select a topic, how to transform that topic into a thesis, how to structure arguments, where to use quotations and how to use them without plagiarizing, how to edit...and re-edit...and proofread...and edit again, and other important tasks necessary to successful research and writing. When you're writing a paper that's supposed to be fifteen pages long, but is stuck at ten pages (or overflowing at twenty pages), your research methods are producing the same five marginally useful sources over and over again, or you think you've written a thesis statement but your professor begs to differ - consult this portion of Turabian and GET THE HELP YOU NEED! Need to know how to cite a live performance you attended last week? A journal article that runs from pages 10-30 and then skips to pages 41-45? How to cite a source in a bibliography vs. a foot- or endnote? How to cite print sources vs. websites and sources in online databases? This is the section for you! The text walks you through the various elements of a given source citation (e.g., author, title, publication info, etc.) and then there are a couple of sample citations you can use as models for your own citations. I usually have a series of Post-it flags stuck to certain source types (books, articles, dissertations) so I can quickly find them quickly without having to flip through the pages or the index. If you can't find a particular source type in the Turabian, check with its bigger sibling, the Chicago Manual of Style, to find the desired source type and accompanying citation example. While getting your citations in order is of utmost importance, there are other document elements that require equal attentiveness. This section of Turabian explains elements of writing and document style, including how to use punctuation (solve the mystery of semicolon usage! ), whether that title should be italicized or placed in quotation marks, how to insert and label tables, figures, and images into your document, etc.